Jack Van Paepeghem works at Meridian Pint and is a Certified Cicerone® You can read his previous post about Downright Pilsner here. read on, for almost all great brewers started out as homebrewers. What is homebrewing? And who are homebrewers? 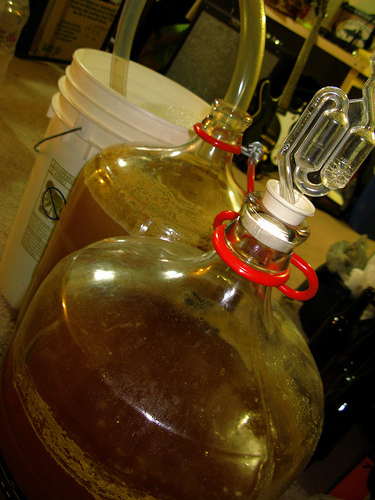 Homebrewing is the production of beer or other fermented alcoholic beverages within the confines of one’s residence. The annual production limit is 100 gallons of beer per person, the sale of which is prohibited by law. However, this law wasn’t enacted until 1979 when Jimmy Carter repealed the prohibition-era law which completely outlawed homebrewing. Go back further and you’ll find that George Washington, Thomas Jefferson, and Ben Franklin all had a hand in homebrewing; several mid- Atlantic breweries have worked to recreate some of their historical recipes. Even President Obama now has a White House homebrewed beer. Homebrewing had its renaissance around the late 1970’s especially on the West coast. Author and avid homebrewer Charlie Papazian began circulating his texts on the “Joy of Homebrewing” and breweries like Sierra Nevada made the transition from basement to brick and mortar. Today, homebrewers are lawyers, doctors, teachers, cooks, musicians—our neighbors. The American Homebrew Association estimated that in 2010, there were over 750,000 people domestically brewing beer in the United States. More than likely you know a homebrewer who has pawned off their latest creation on you. The idea of making beer is simple, but the effort it takes to actually produce a clean, “right” tasting beer depends on an enormous range of factors and variables, and when executed well is humbling and delicious. And when it all goes to hell, it is, well, a learning experience. If you are to take anything out of this, it is this: brewing beer is the best way to learn about beer— process, ingredients, styles, techniques, flavors, off-flavors, and just about everything that has to do with beer. And the homebrew community is an invaluable resource. Ever want to know what off flavors taste like? Just go to a DC Homebrewers meeting and try some beers from beginner brewers. My favorite was an American Wheat ale that tasted like burnt rubber and buttered popcorn which launched a discussion of washing procedures and yeast health. Don’t be alarmed by technical brewing jargon, homebrewers offer only constructive criticism and are more than happy to help you understand, and they won’t bite. DC Homebrewers hold meetings and events at least once a month which are hosted everywhere from beer bars to backyards. Smith Commons recently held an open to the public back porch pig roast that was accompanied by an “all grain” brewing tutorial, where the public feasted on swine and mingled with local homebrewers over a few cold homebrewed ones. You can also find the community online at Twitter and Facebook where members and followers can post about events, brewing questions, and say you just broke your hydrometer? Chances are somebody out there will be more than happy to let you borrow one in exchange for a homebrew or two. The camaraderie, support, and outreach of homebrewers are enormous, especially considering that they work full time jobs just like you. Until recently, homebrewers in the District had to trek to either Columbia, Maryland or Falls Church, Virginia, or order online to get a hold of equipment and ingredients. Now all it takes is a quick jaunt up to Takoma Park to visit the DC Homebrew Shop, part of 3 Stars Brewing Company which recently debuted its beers this past DC Beer Week. Founders and owners Dave Coleman and Mike McGarvey started as homebrewers and wanted to give back to the community which inspired them to start a commercial brewery. The shop is stocked with equipment for both beginners and those going “all grain.” Malted barley and other grains are kept on stock in bulk to reduce the waste from individual packaging, and buyers may put in individual preorders which can be picked up from the store. This reduces the problems of overstocked perishable items going to waste and frees the consumer of shipping fees. The space also hosts homebrewer meetups and beer swaps and will later serve as 3 Stars’ tasting room. This past year, Meridian Pint hosted six “Homebrewer Match-ups” where brewers showcased their works to the public for free and one “best of show” winner from each was chosen by popular vote. Homebrewers get to talk about their beers and neighborhood folks get to try over two dozen different beers, for free. Everybody wins. The six winners threw down at the final match up in June and 75 select judges decided which recipe would makes it way to DC Brau to be brewed on full scale. Brau’s owners Jeff Hancock and Brandon Skall also started out as homebrewers and decided that this was a unique homage to their roots, and gracefully chose two winners from the final showdown. The first is a Belgian-style patersbier, or single, brewed by Brian Barrows. The beer, “Your Favorite Foreign Movie” (inspired by the brew-day jams of Steely Dan) is light bodied and fermented with Chimay yeast, dry, citrusy, quenching, perfect for summer days ahead. The runner up is “Chocolate Rain,” a slick, velvety, bittersweet chocolate porter brewed by Mike Reinitz which will debut later this fall. Homebrewing is alive and well in the District and I’m looking forward to the next round of Homebrewers Match Ups at the Pint as well as ongoing events at DC Homebrew Shop, Smith Commons, and anywhere else where truly local beers are being crafted and enjoyed. Itchin’ to brew? Below are some resources to get the yeast going in your hood.